The hardest thing to do in golf -- and maybe sports -- is close out a tournament you're defending with a slim lead going into the final day. That's exactly what Paul Casey did on Sunday at the Valspar Championship as he held off Dustin Johnson, Louis Oosthuizen and Bubba Watson for his third PGA Tour victory. Maybe most impressively, Casey did it with the No. 1 player on the planet on his hip. Johnson trailed by one entering the final round, but Casey birdied the first and never took on a serious threat from the most threatening man in golf. It was Casey's sixth 54-hole lead but just his second victory in such scenarios. Following a hilly front nine of 1-over 37, Casey tightened his game and his lead on the field with birdies on two of his first five holes on the back nine, and he played the final three holes -- known for being named after a serpent at Innisbrook Resort -- in 1 over. The 72 in Round 4 was better than the field average on Sunday, and enough to seal the deal by one over Oosthuizen (and late closer Jason Kokrak). It was the same margin he won by last year over Patrick Reed and Tiger Woods, but it wasn't even close to the same feeling, Casey said. Since 2010, players with a 1-shot lead after 54 holes on the @PGATOUR win 30% of the time. Paul Casey leads by 1 entering today's round. "Today wasn't easy," Casey told NBC Sports. "That felt very different since winning last year. Last year's win was so big. That felt like my first victory as a professional. I've felt so different since then. New confidence. I'm getting older, but I feel like I'm getting better ... This is so cool, I'm so happy." 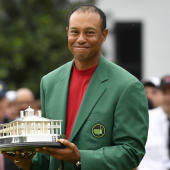 Now the Englishman will go to Augusta with even more of that confidence following a spring in which he has a pair of top-five finishes and a victory on the PGA Tour. He's ... well, he's a sneaky fun pick to win his first major three weeks from today. Since 2005, here are the leaders in percentage of rounds in the 60s at Augusta National (min. 20 rounds). Here are the rest of our grades for the 2019 Valspar Championship. Dustin Johnson enters this week with 11 consecutive rounds in the 60s, the longest such streak of his @PGATOUR career. The 2nd-longest active streak of rounds in the 60s right now on Tour is just 3.